A Flutter of Fans – A Very British Romance? 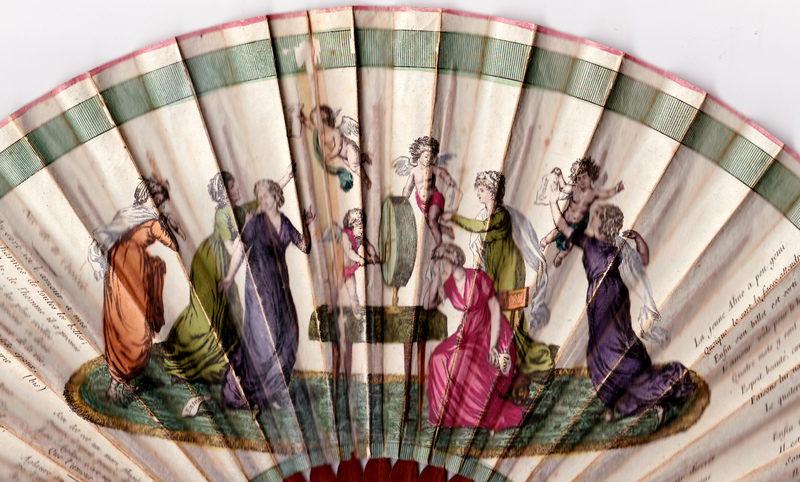 Watching the first episode of Lucy Worsley’s fascinating A Very British Romance last night I was inspired to look at my collection of 18th and early 19th century fans to see how they treat romantic love. 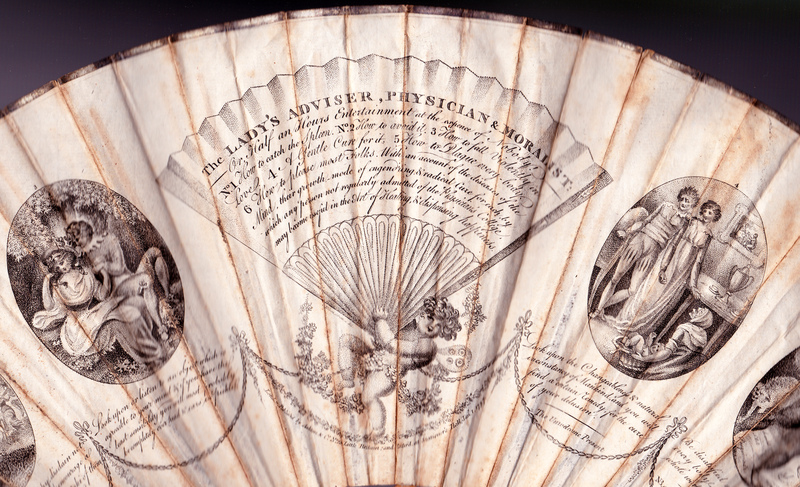 Fans were not only a practical necessity at hot and over-crowded balls and receptions, but they were also items of high fashion, conversation pieces and even sources of satire. And, of course, what better aid to romance for a strictly-chaperoned young lady who could deploy an entire range of flirtatious gestures with her fan – peeping over the top of it; hiding, then revealing her face; gesturing an invitation or snapping it shut sharply in rejection. 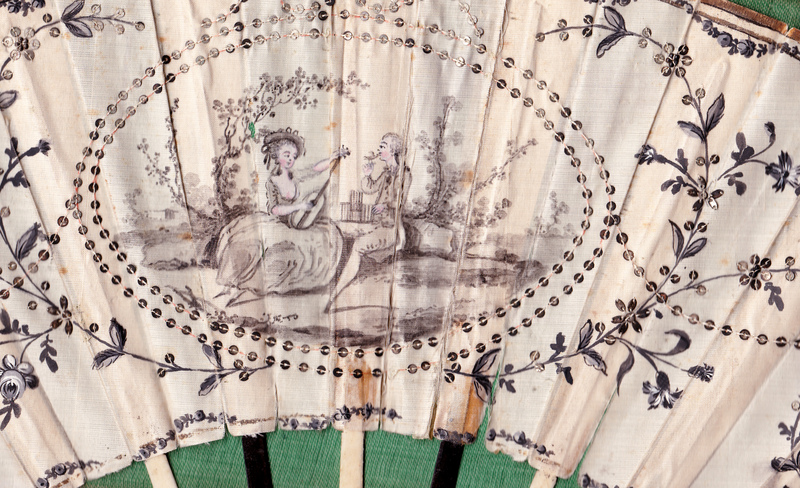 The earliest – perhaps 1770s – is a simple fan with widely spaced black and white sticks. The leaf is painted on one side only in black, white and grey, with tiny silver sequins sewn through the pattern. 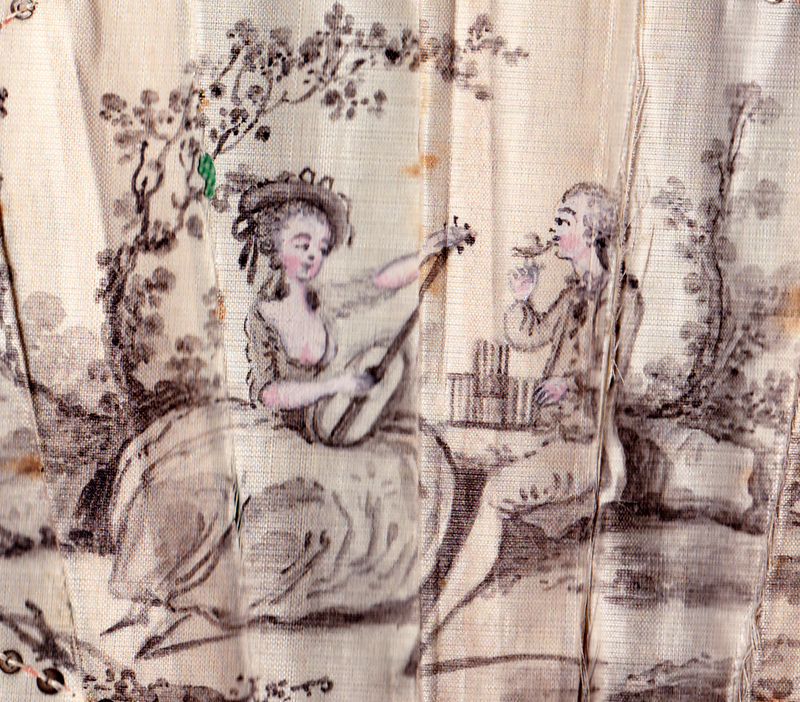 The man and woman in the centre have delicate touches of pink on their cheeks, hands and on her bosom. This is a very informal outdoor scene. She is playing a guitar and perhaps singing a romantic song. He is sitting with his legs astride the bank, and raising a small bird to his lips, apparently to kiss its beak. A love bird? From their intense exchange of looks it is quite clear that hers are the lips they would both wish he was kissing. The most modern (c1818?) is also outdoors. It is a detailed hand-painted and gilded scene set in the parkland surrounding a large country house. The young lady in the centre is gathering flowers which she is collecting in the bonnet which she has casually hung from a bush – perhaps an indication that she would like to shed a few more items of clothing if the right circumstances arose. On the other hand, a lamb, a symbol of innocence, is sitting by her side. A young man, his gun over his shoulder and his ammunition pouch at his side, strides off on the other side of the lake with his dog at his heels. He is off hunting – but what or who? He is certainly very aware of the young lady and I would hazard a guess that she is just as aware of him. No doubt she set out early to compose herself into just this charming and innocent pose for his benefit. 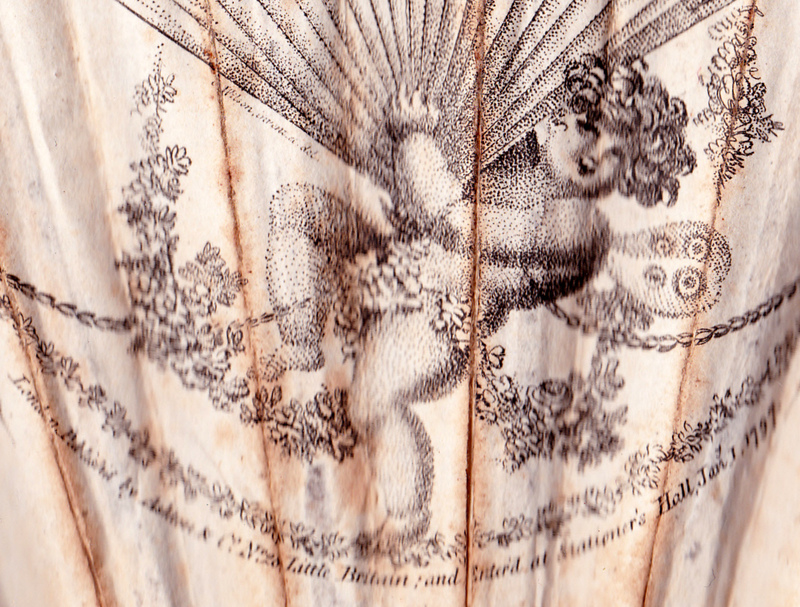 Now for a fan which I found in circumstances which I can only call romantic, if not downright spooky. I was writing The Piratical Miss Ravenhurst, the last of my Scandalous Ravenhurst series. My heroine was called Clemence – not the most common of English names. I was halfway through the book when I visited an antiques auction and spotted the handle of a fan poking out of a mixed lot of odds and ends. It had no loop on it – an almost infallible sign of an early fan – so I took a quick look and put it back before anyone else saw me taking an interest! 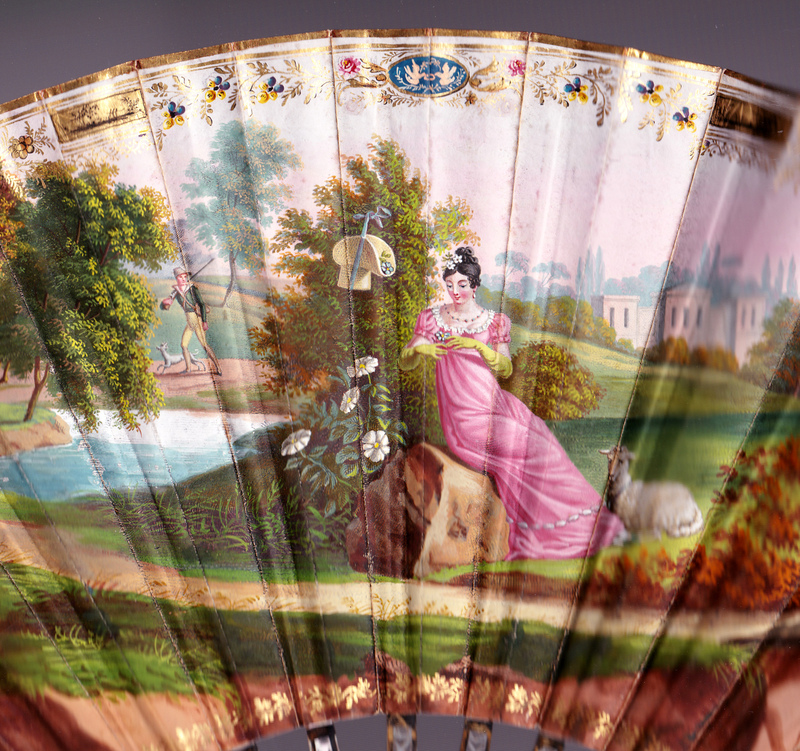 In the event I got the whole lot for under £20 and when I had a good look at the fan I could tell it was not only late 18th century, but also French. The scene shows six young women in a lottery for love. The cupids draw a description of the virtues the lover of each will possess, described in very difficult old French in verses around the edge. (I have to thank fellow author Joanna Maitland for the translations!) Poor Isis is in a hurry to receive her prediction – but her lover will have no virtues whatsoever. The next girl, “Aglaé, le coeur palpitant” – “her heart beating” – is destined for a lover who is articulate, but weak in spirit. Each girl in turn is told of a lover with two, then three, then four virtues. The final young woman is Clémence – my heroine’s name! And not only is her lover going to be handsome but he will surpass her hopes in every way. Elle a gagné le quine. “Look upon the Changeableness & natural inconstancy of Mankind, and you will find a Certain remedy, for the cure of your delusion.” Really rather a scandalous scene for a lady’s fan! All the London newspapers began the week by printing long, stolidly indigestible, extracts from the Paris press along with editorial pieces sneering at Napoleon’s attempts at establishing a constitution and reports of arms and ammunition flooding into Paris for the army. 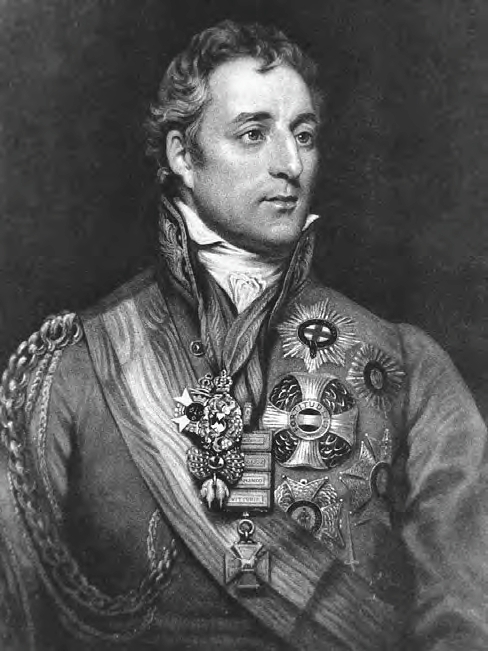 The Times reported that the Duke of Wellington was expected to make his headquarters at Brussels and that he commanded troops in a line from Ostend to Charleroi, but that opinion was very divided on the continent about whether war would – or should – break out. The Duke (shown in a portrait by Thomas Phillips) was reported to be in favour of it. “Drury Lane Theatre – on Saturday night a most crowded and brilliant assembly were attracted to the representation of a new tragedy by Mrs. Wilmot, a Lady of Fashion, which had been got up with great splendour of decoration and in favour of which there was the most sanguine anticipation. It is a story of the Saxon era of our nation…There were abundant materials for dramatic interest and effect… The plot was pregnant with those high sentiments of honour and gallantry which distinguished our Saxon ancestors… The materials were, in short, ample for the production of a play of great interest but the Lady has rather produced a dramatic poem than a regular drama.” By the third act, despite Mr Kean in the leading role, the audience was getting restless and “the whole of the fifth act passed with the incessant impatience and condemnation.” The unfortunate Mrs Wilmot presumably retired discomforted and the piece was never heard again. 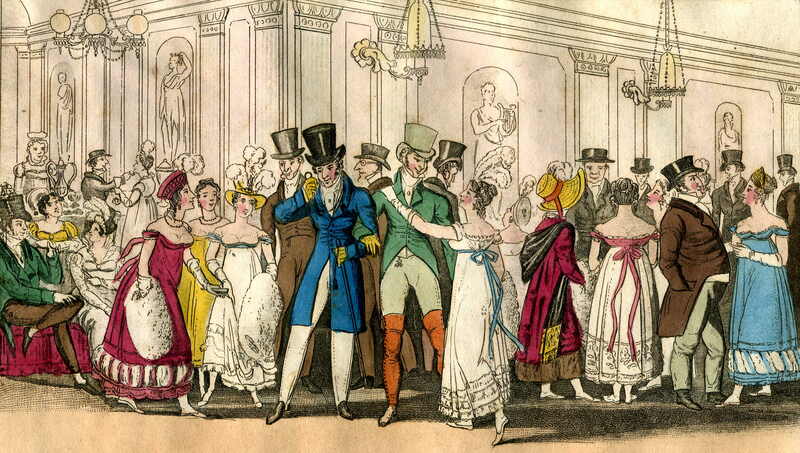 The print below shows the fashionable crowd outside the boxes at Drury Lane – and the dashing young ladies hoping to attract one of the dandies on the strut there. Sadler’s Wells, which had been showing a recreation of the Battle of the Nile “on real Water” had now, presumably reflecting the popular mood, added more ships and the “blowing up of l’Orient” along with an illuminated transparency of Nelson. On Saturday 29th Generals Ponsonby and Bing, along with their horses, embarked at Ramsgate on the “Duke of Wellington” for Ostend. Colonel Smith’s F Troop of Artillery had also arrived at Ramsgate and were expected to embark on the next tide. On which note, with the artillery bound for the continent, I will mention the trilogy of Waterloo novels – Brides of Waterloo – which I have written with two fellow authors. They are available for pre-order now. 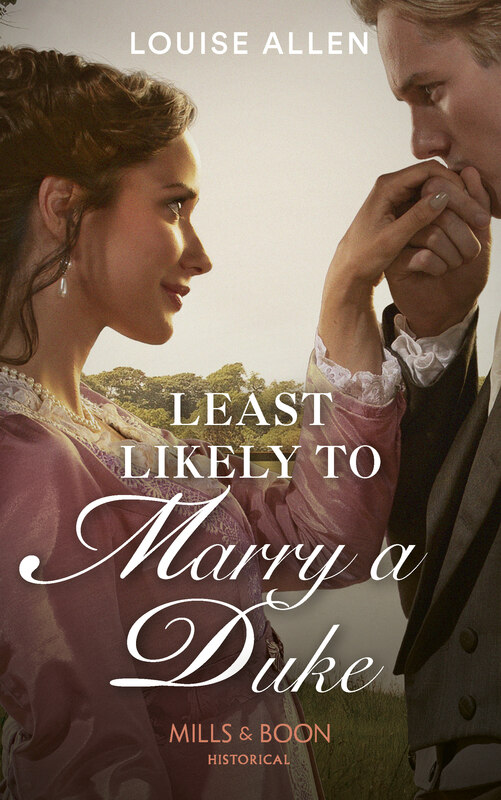 The first, A Lady For Lord Randall, by Sarah Mallory, will come out in May. 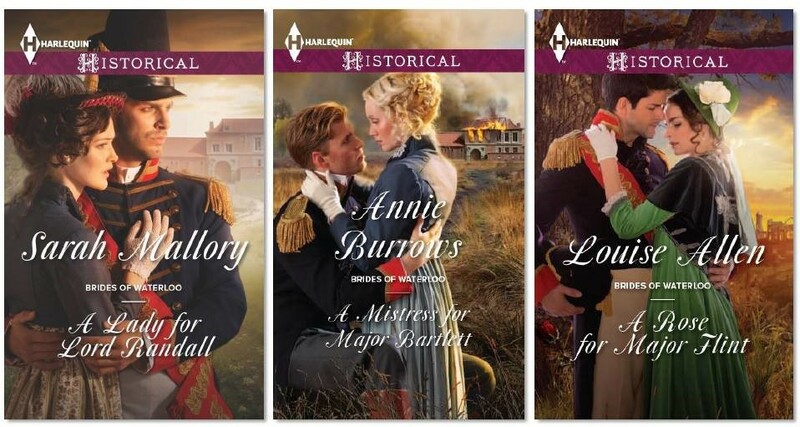 A Mistress for Major Bartlett, by Annie Burrows, is due in June and my book, A Rose for Major Flint, comes out in July. The novels are linked by their heroes – all artillery officers – and the timeframe runs from several weeks before the battle until several weeks afterwards.